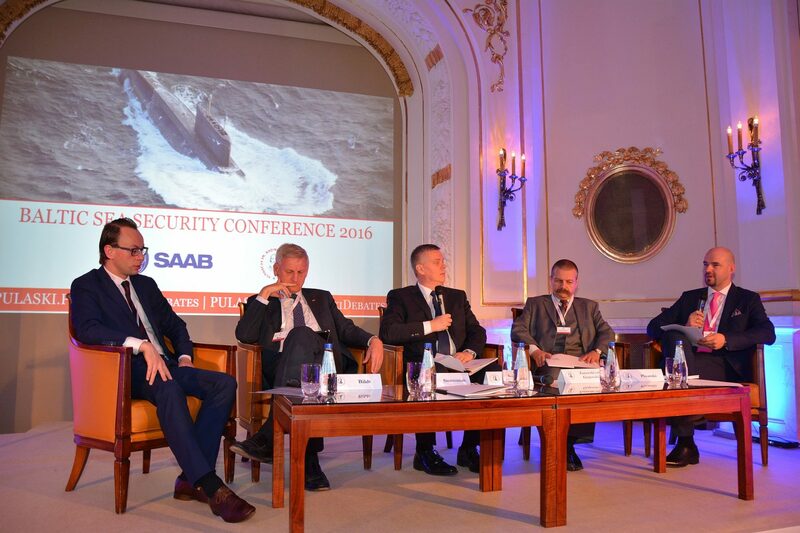 On July 9, 2016 Casimir Pulaski Foundation organised the Baltic Sea Security Conference. An important task of the conference was to provide a platform for discussion on the security in the Baltic Sea region and to assess the potential of cooperation between navies of various countries. “Key thing in this perspective should be the choice of appropriate equipment, which the Baltic Sea states should possess” – said Zbigniew Pisarski, the President of the Foundation. “Poland is currently implementing a modernization programme of the Navy. The experience of other NATO countries can be very practical for selecting appropriate solutions” – he added. Among speakers there were Carl Bildt – Prime Minister (1991-1994) and Minister of Foreign Affairs of Sweden (2006-2014); Tomasz Siemoniak – Deputy Prime Minister (2014-2015) and Minister of Defence of Poland (2011-2015); Krzysztof Kozłowski – Undersecretary of State, Ministry of Marine Economy of Poland; Marko Mihkelson – Chairman of National Defence Committee of the Parliament of Estonia; Michał Jach – Chairman of the Commission of National Defence of the Parliament of Poland; Rasa Juknevičienė – Minister of Defence of Lithuania (2008-2012), Member of the Committee on National Security and Defence of the Parliament of Lithuania; Grzegorz Poznański – Ambassador, the Security Policy Department, Ministry of Foreign Affairs of Poland; Ian Brzeziński – Deputy Assistant Secretary of Defense for Europe and NATO Policy (2001-05), Senior Fellow at the Atlantic Council; Rear Admiral Jonas Haggren, Head of Policy and Plans Department, the Swedish Armed Forces Headquarters; Magnus Bergman – Head of Military Affairs Department, Ministry of Defence of Sweden. In total, conference gathered 200 politicians, diplomats, experts and military commanders. Conference was supported by National Security Bureau, Ministry of Marine Economy of Poland, Naval Defence Academy as well as expert portals and magazines like Defence24, New Military Technique and Security and Defence.